Coins are minted to mark great moments! 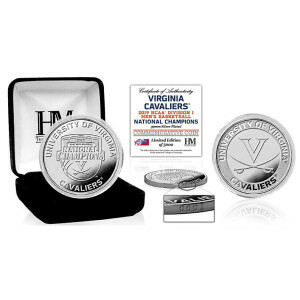 The 2019 NCAA Men's Basketball Champions silver plated coin is a limited edition of only 5,000. This coin is minted with the 2019 NCAA Men Basketball Champions official logo on the obverse (front). The reverse (back) of the coin is minted with the school’s logo. Each coin measures 39mm in diameter and each coin is individually numbered on its edge. A certificate of authenticity accompanies each coin delivered in a protective capsule and a custom jewelry case. Officially licensed and proudly made in the USA by The Highland Mint.